I have read the book, The Help and I loved it so I was unsure about what the movie would bring. The movie, however, remained mostly true to the book and was perfect. At more than 2 hours, it is long but at no point will you find yourself waiting for the time to pass. The characters were perfectly cast -- I think all of them. Loved Skeeter, although it took me a minute or two to reconcile her with the picture I was carrying in my head from the book. Aibileen was amazing, loving and brave. Minnie, strong and feisty. Celia, absolutely hysterical. Hilly definitely not nice. The mother, spot on. I really like what Jeremy Jahns had to say about The Help so I thought I would share his words here with you. I appreciated the fact that he toned down the foul language for this movie review. (Too bad he wouldn't do that for all of them.) 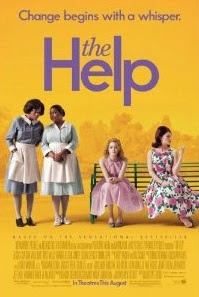 About The Help he says that it is a well-written, well-acted movie and the characters are really likeable, too. I agree. I like his review. I loved the movie. I feel comfortable HIGHLY RECOMMENDING it to you. It will make you laugh and it will make you cry and it does NOT matter if you have read the book. My husband enjoyed this movie as much as I did and he had not read it. Read more about what the experts are saying about The Help by visiting my page about what the experts are saying by clicking right here and be sure to let us know what you thought of it, if you have seen it. Glad to know your husband liked The Help, too. I'm looking forward to seeing it. We rarely go to the movies so it might be a while, but I'll definitely put it on my "must see" list. Thanks for the great review! I haven't seen this yet but my friend who's read the book reviewed it for me and she loved both. It's nice when a movie adaptation lives up to the book. Can't wait to see this.